CMSWillowbrook built the new PIKE Fraternity House on the Oklahoma State University campus in Stillwater, OK. The project began with demolition of the existing Baptist Student Union at the intersection of University and Monroe at Oklahoma State University and the subsequent construction of a four level (basement and three above ground) new structure. 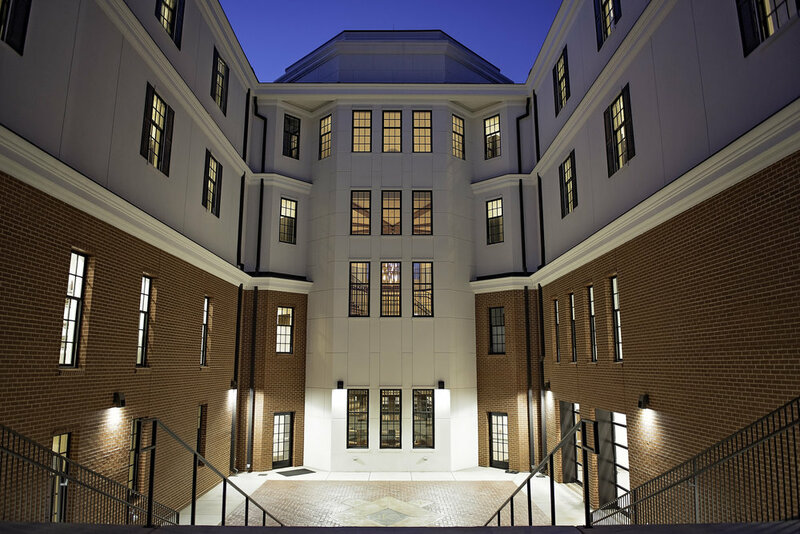 The upper two floors serve as living suites while the first floor and basement serve as dining facilities, chapter room, workout facility and an indoor basketball gym. The building is a mix of steel structure and off site pre fabricated load bearing cold form framed panels. Exterior is campus traditional brick and cast stone. Interiors are of the highest quality materials with extensive wood millwork paneling and natural stone and ceramic tile. Due to tight site conditions and schedule, many components were fabricated off site utilizing a detailed BIM model for virtual design and construction (VDC).